Hey Friends! Happy Thursday! 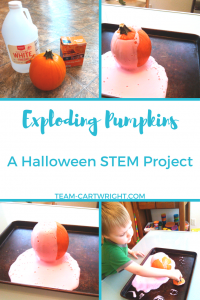 I'm so excited to have Kimberly from Team Cartwright guest posting about a really fun Halloween project.... Exploding pumpkins!! So fun! You can find me at Mamas Organized Chaos sharing a strategy for handling big emotions in our kids. 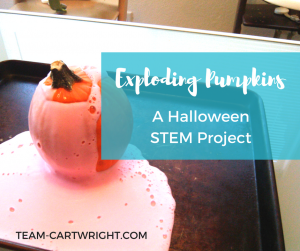 Halloween is a great time of year to work on some STEM with your kids. Things are spooky, icky, sticky, and sometimes a little gross. Perfect for some easy chemical reactions. I love that you can do some of them in a pumpkin. Festive and easy clean up! That is exactly what we are doing today- making lava spewing pumpkin. You need a few ingredients for this one, most of which you probably already have. Here is how to put it all together. 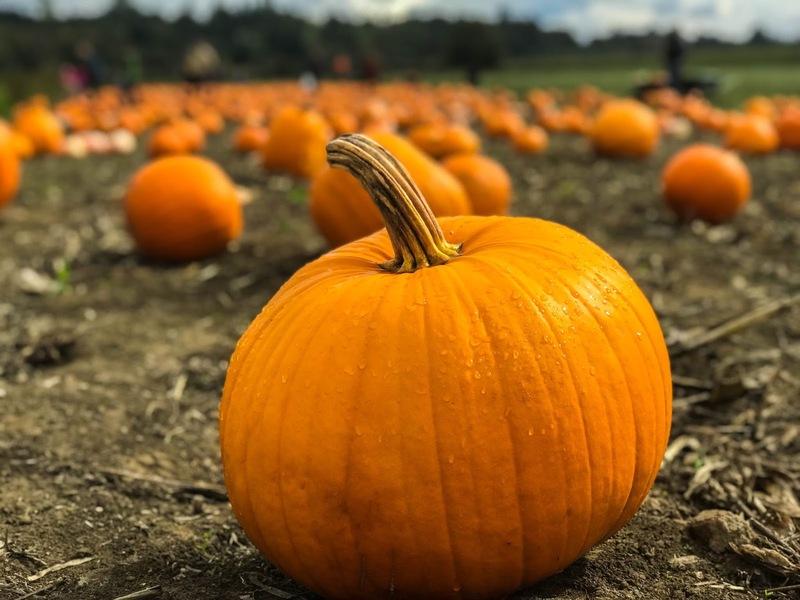 Prep your pumpkin for carving like normal. Even carve in the face if you want the foam to ooze out that way! Mix the yeast and the warm water, and let it sit for a few minutes. While the yeast and water sit add the hydrogen peroxide, food coloring, and dish soap to the pumpkin and mix together. Pour in the yeast, put on the top and watch the foam rise! For toddlers and preschoolers, just knowing this a chemical reaction is taking place is often enough of an explanation. But if you are doing this with older kids they might want to know a bit more. Hydrogen peroxide breaks down into water and oxygen. The yeast acts as a catalyst to speed up this reaction. The soap traps the oxygen as it is produced making bubbles so we can see it. This is the foam that is formed. The food coloring just makes it cooler looking. This is what is called a balanced equation for the reaction. Don't worry, I won't go too deeply into it, but basically, it says that two hydrogen peroxide molecules will yield two water molecules and one oxygen molecule. It is exothermic, which means it produces heat! You can add a bit of art into this project by using the pumpkin top as a stamp! The food coloring makes it fun to create a picture with the foam. It will dry and leave some color.